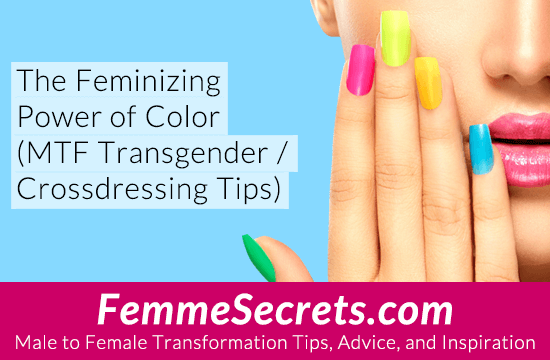 Did you know that the colors you wear have a huge impact on the way people perceive you – particularly when you present yourself as a woman? Colors send subconscious messages and can definitely influence how feminine or masculine you are seen to be. Do you know what you’re projecting with your outfit and accessories? This is a detail you don’t want to overlook! White is associated with purity and innocence, which is why it’s traditionally worn by brides. Wear white if you want to look pure, pristine, and impeccable. Light blue sends messages of peace, trust, and understanding. Dark blue is associated with authority and masculinity (think police uniforms), so use this color sparingly. The best blues for crossdressers and transgender women are light blue and baby blue. Red is the most intense color of all and is associated with passion, desire, love, and sexuality. Wear red if you want to be noticed! Pink is the color of love and romance. 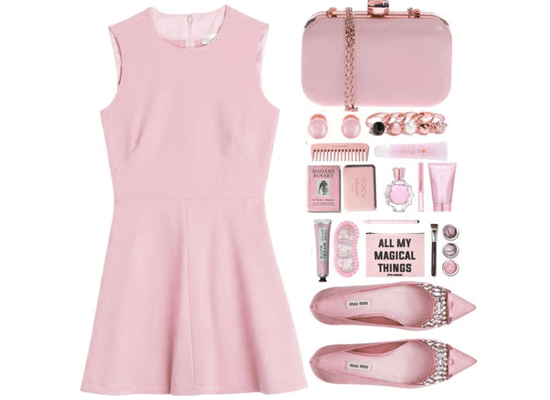 No surprisingly, it’s also the most feminine color, so you’ll want to incorporate plenty of pink into your wardrobe. Black is associated with power, elegance, and formality. Wear black when you want to look sophisticated and mysterious. Purple communicates mystery, magic, and creativity. This is a great color to wear if you want to add a touch of fantasy to your look. Light green symbolizes freshness and youthfulness, while dark green is associated with money and ambition. Wear a soft shade of green to add a fresh, feminine vibe to your look. Yellow is the color of joy and energy. Wear yellow to show off your fun, playful side. Avoid yellow when you want to be taken seriously. Like yellow, orange is associated with joy, enthusiasm, and attraction. 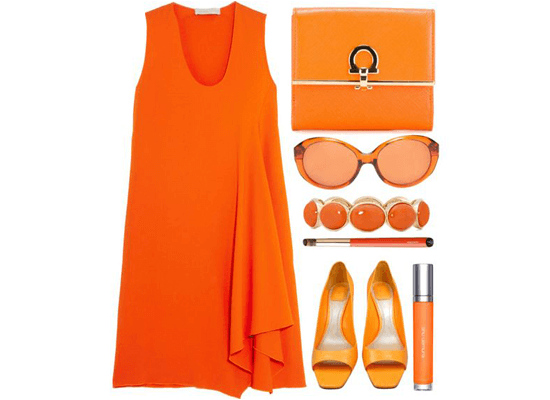 This is a great color to wear when you want to liven things up. Brown is a stable, wholesome, and down-to-earth color. Wear brown for mellow occasions or if you want to appear reliable and genuine. Gray is great color to wear when you need to come across as professional and trustworthy. Too much gray can get boring though, so be sure to punch it up with some fun colors. Beige is a simple, conservative color that’s friendly, approachable and non-threatening. It’s perfect for times when you want people to open up to you. What’s your favorite color to wear en femme? As always, I’d love to hear your thoughts. What’s your favorite color to wear en femme? Does this color project the message you want to be sending? P.S. Color is a HUGE topic that doesn’t just relate to clothes. Hair and makeup are equally important! 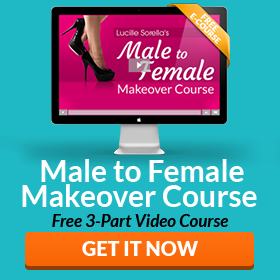 To learn more about choosing and applying the most flattering makeup colors, check out Makeup Magic: The Ultimate Male to Female Makeup Program. What's your favorite color to wear en femme? Me, a nervous groom, the day I wed my bride. A few years later, we BOTH wore tuxes for our official, LEGAL wedding. My husband’s a relatively regular crossdresser and often wears very conservative skirt suits. Our FIRST wedding, by the way, wasn’t the LAST time that bridal gown saw use! I’m in suits and bow ties ALL the time, and my husband likes to crossdress. When we were first wed, I wore my tuxedo, and my “bride” wore a gorgeous bridal gown and veil, as you can see. For our official, legal wedding a few years later we both wore tuxedoes. My groom enjoys crossdressing, so I rather relish the very bridal look from our first wedding. The memory of being all tuxed and buttoned-up, and bow tied, feeling my bride pressed up against me in all that bridal gown and veil, just mmm MM ! I’m a guy who wears suits pretty much daily (almost always three-piece), heavily-starched shirts (usually white), and BOW ties, ONLY bow ties. My husband occasionally crossdresses. When we were first wed, I wore my tuxedo with a matching vest and bow tie, my “bride” wore a gorgeous bridal gown and veil, as you can see. For our official, legal wedding a few years later we both wore tuxedoes and bow ties. I rather relish the very bridal look from our first wedding. The memory of being all tuxed and buttoned-up, and bow tied, feeling my bride pressed up against me in all that bridal gown and veil, just mmm MMM! SO romantic! Now he’s in suits and bow ties all the time as well, but that wasn’t the LAST time he wore that bridal gown!